Thread: Anyone using the Thomson titanium riser on a rigid bike? I'm lusting after a set of these, but would need some compelling evidence of their magical trail buzz eliminating properties to make me part with the cash. Would be replacing an Easton Havoc Carbon on my 29+ Stooge. I have the titanium flat bars and the carbon flat bars. So far the titanium has been nice need to get out and ride again to make sure I wasn't blinded by the titanium bling factor. Overall they ride great with a rigid fork. They don't flex but it does feel different from the carbon bars. It's hard for me to describe. I got my bars from chain love for 150 so I didn't pay full price. Ti is definitely bling......but nothing near the damping of carbon. Sorry. I had both, and ended-up with the Thomson X-Country carbon 730mm bars....so plush. I agree they don't dampen like carbon but they do have a different feel. Not bad just different and it needs to be riden to experience. It's also nice to be able to have both carbon and titanium with the exact same dimensions to truly get the feel of the material Though. ^I think there are a lot of opinions about Ti handlebars that are very misleading. Although I have no experience with them, my research turned up the fact that no two Ti/Carbon/Alum bars are the same. All are made differently, but Twenty2 cycles is able to custom make one for less than a Thomson if I remember. Relatively cheap experiment on chainlove for the Thomson Ti bars. They were around $155.83 shipped when I picked mine up last week. You could probably flip them for at least that much if you don't like them. They are going on a Ti hardtail though. I guess I could try them on the rigid but I ordered some carbon bars for that one. Still waiting for the trails to dry out! Edit: Sorry, I don't think they had the riser version. I think they had the 12 degree sweep only. Chain love only had 2 6 degree and 2 12 degree as of January now I think they have a 12 degree left. No risers on there. 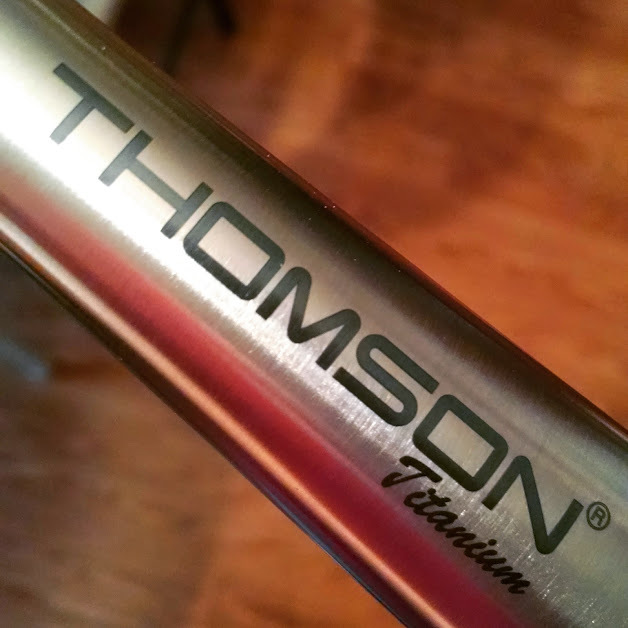 NEW Thomson Carbon/Titanium Bar Availability? ?